A First Alert was issued Saturday afternoon and lasts into Sunday for a coastal storm that could bring heavy downpours and localized flooding. We're in for more rain this week. When will the wet weather end? 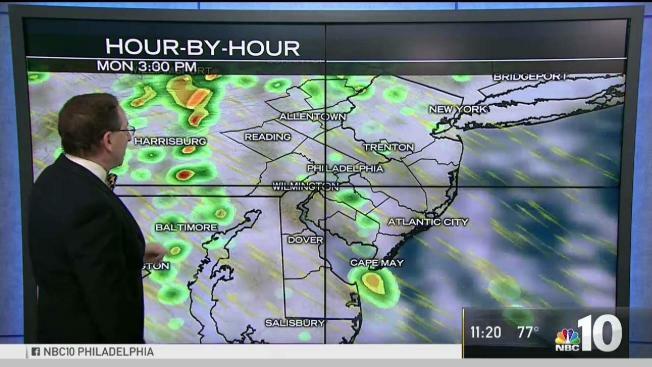 NBC10 First Alert Weather meteorologist Glenn Schwartz has the forecast. First Alert Weather Team issues a First Alert for the threat of heavy rain and localized flooding starting Saturday afternoon into Sunday. Saturday begins a stretch of more than a week of days where some neighborhoods could see rain. “There will be days when everybody gets rain but there will be days where just some neighborhoods do and not others,” Tammie Souza says. A strong coastal storm slammed the Philadelphia area with torrential downpours and flooding Saturday and Sunday as the region entered a humid and wet patch that will last through next week. The NBC10 First Alert Weather Team issued a First Alert for the threat of heavy rain and localized flooding from Saturday afternoon through early Sunday. Utility companies worked Sunday to restore service to thousands of customers left without power by storm. Thousands of customers were without power in Chester County Sunday. Storms also caused flooding throughout Chester County. Officials say 14 people trapped in floodwaters had to be rescued in Coatesville. Saturday's Phillies game against the San Diego Padres was rescheduled to Sunday as part of a split-admission doubleheader, due to the rain. The makeup game will be scheduled for Sunday at 6:05 p.m. while Sunday's regularly scheduled game will be moved from 1:35 p.m. to 12:05 p.m. Fans holding tickets for Saturday's game may attend Sunday's 6:05 p.m. game using their original tickets. Those who are unable to attend that game may exchange their tickets for any remaining regular season home game in 2018. A Flash Flood Watch was in effect through Sunday morning and flooding was reported in Wildwood, New Jersey Saturday. Conditions cleared early Sunday morning but rain later returned in parts of the area. Rain and cloudy skies are expected Monday as we enter a pattern of humid and gloomy days caused by an atmospheric river, which is a narrow stream of moisture flowing over the area for days on end. In California, for example, the phenomena has been nicknamed a "Pineapple Express." In our case, the Bermuda high will be directly to the east, blocking an area of low pressure directly to the west, creating a channel for the moisture overhead. Temps will be seasonable in the 80s through the week but with high humidity it should feel like Florida. “There will be days when everybody gets rain but there will be days where just some neighborhoods do and not others,” Tammie said. “Some days are going to be gray all day with periods of heavy rain, other days you may see partly sunny skies, it may warm enough for a pop up storm,” Tammie said. The best bet is to stick with the NBC10 First Alert Weather Team on air and on our app through the weekend and next week for the latest on the wet weather.